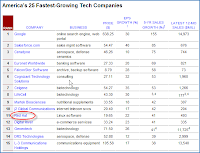 Forbes magazine recently compiled a list of the top 25 fastest growing companies in America. And guess what, Red Hat is placed 11th in the list (See Fig. below). The criteria for Forbes’ list mainly focused on sales growth , profitability (at least $25 million in sales over the past four quarters), growth outlook and the lack of legal, accounting or corporate governance issues. Google which generated nearly $15 billion in revenues in the last 12 months topped the list. Wow. I totally missed this. thanks for the info.